Alternative Fox present a reissue of Piero Umiliani's Il Paradiso Dell'uomo, originally released in 1963. Italian film composer Piero Umiliani enjoyed a long and illustrious career, creating nearly 200 film soundtracks, along with 40 music library LPs, and some 35 television themes. Born in Florence in 1926, he was first recognized internationally for his work on the soundtrack of 1958 crime caper I Soliti Ignoti (AKA Big Deal on Madonna Street, Persons Unknown or Le Pigeon), which featured noted jazz trumpeter, Chet Baker -- the first time, in fact, that jazz music had been used for an Italian comedy feature. Umiliani teamed with Baker again in 1961, along with Croatian-American jazz singer Helen Merrill, for the soundtrack of Smog, a drama about an Italian lawyer's unintended escapades in Los Angeles, and his work was later featured on American and British television shows, including The Muppets, the Benny Hill Show, and the Red Skelton Show. Il Paradiso Dell'uomo (AKA Man's Paradise), subtitled "Forbidden Japan", was a little-known documentary released in 1963 focusing on the roles assigned to women in the country, from the traditional pearl-fishing divers of the coast and urban factory workers to traditional dancers and the ambiguous world of geisha and striptease. This impossibly-rare soundtrack mixes eastern and western musical elements, veering from classical tropes to swing jazz, with Chinese singer Mei Lang Chang on a couple of tracks and singer/composer/musicologist Francesco Potenza leading the chorus on another. 180 gram vinyl. 2012 release. Digitmovies, with collaboration of Gruppo Sugar, release for the first time, Piero Umiliani's soundtrack of the movie La Vendetta Di Lady Morgan (aka "Das Folterhaus Der Lady Morgan"). In 1965, after 5 Tombe Per Un Medium and Il Boia Scarlatto (both released in 1965), Massimo Pupillo directed his third gothic horror movie. The movie is one of the rarest Italian Gothic ever as at that time it had had a poor distribution and nowadays is still unreleased on the home video market. After the tragic death of her boyfriend Pierre (Michel Forain), Susan Morgan (Barbara Nelli) reluctantly marries Sir Harold (Paul Muller), who, by trying to drive the woman into suicide, wants to become heir to the riches of his wife, along with the housekeeper Lilian (Erika Blanc) and the butler Roger (Gordon Mitchell). Lady Morgan commits suicide by jumping from the tower of the castle, but returns as a ghost to take revenge on his "assassins", and even Pierre, who in fact had escaped from death, is killed because of the spirits and will be forced to wander for eternity as a vampire. 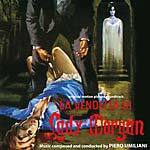 La Vendetta Di Lady Morgan is full of all those elements which characterize the Gothic genre: the ancient castle, ghosts, vampires, and bloody revenge. Pupillo manages to stage a good horror film, maybe more in the vein of a stage than a movie drama, with a not very original plot, but without a doubt exciting and full of surprises. 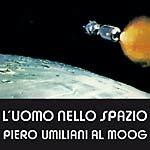 Piero Umiliani, one of the great names of film music and jazz in Italy, does not need a long presentation considering his long filmography which includes such internationally known successes as "Mah Nah Mah Nah". 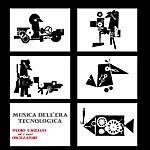 Maestro Umiliani (under the pseudonym of Peter O'Milian) has written a symphonic score featuring a ballad with an ancient flavor for classical guitar and orchestra which is reprised and alternated with experimental electronic music, dramatic and gloomy passages. For Digitmovies' CD they used every note recorded in mono during the original session. A must-have CD for the archives of all those who love this prolific genre. 2013 release. 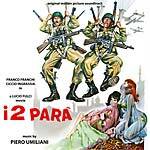 Digitmovies present, for the first time on CD, Piero Umiliani's complete original soundtrack for the film I Due Parà ("The Two Parachutists"). 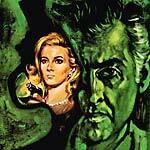 Directed in 1965 by Lucio Fulci and starring Franco Franchi, Ciccio Ingrassia, Umberto D'Orsi, Luciano Bonanni, Roberto Camardiel, Monica Randall, and Francesca Romana Coluzzi. Franco and Ciccio Impallomeni (Franchi and Ingrassia) are two Sicilian street artists who, after a disastrous performance, decided to emigrate to the United States of America, but they get on the wrong ship and eventually arrive in New Quiracao, the capital of Santa Prisca, oppressed by bloody State dictatorship of General Jose Limar (Camardiel), who is supported by the US and asks them for help in the civil war that opposes baffudos and sbarbados, but the ambassador announced that the American paratroopers defend only their fellow citizens and attack the rebels only if offended first. Limar architects then a trick: take two prisoners from the concentration camp, disguise them by paratroopers and create turmoil with the baffudos in order to burst the hostility between them and the US army. For the task are chosen Franco and Ciccio, that were immediately captured on their arrival, but they even manage to come to power: Ciccio can then use the title of Ciccio I, dictator of Santa Prisca. Their political experience lasts very little: subsequently arrested by the Americans, finally take a plane believing to arrive in the States, but they are forcibly conducted to Vietnam. This CD was possible thanks to Beat Records, where the master was assembled using the mono master tapes of the original session. Umiliani composed a funny circus theme for the head credits, alternating with the music of the atmosphere with an Arab flavor, to western-style Deguello music, waltz, Mexican mariachi, American march, a wild South American dance music for trumpet, and suspense. 2013 release. 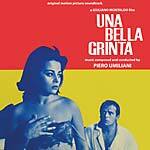 Digitmovies, in collaboration with the Sugar Group, present on CD, the full version Piero Umiliani's original soundtrack for the movie Una Bella Grinta ("The Reckless"). Directed in 1965 by Giuliano Montaldo and starring Renato Salvatori, Norma Bengell, Antonio Segurini, Giuliano Montaldo, Alberto Mesi, Enrico Rame, Celso Fava, Dino Fontanesi, Umberto Juli, Marina Malfatti, Vito Cipolla, Gino Agostini, Primo Baratella, Bereno Bartolini, Loris Serra, Luciano Serra, Raffaele Triggia, Iginio Marchesini, and Antonio Domenighini. The ambition to go up in the scale of social values and the pathological desire for money, are personal circumstances of Ettore Zambrini (Salvatori). The man would like to make his fortune in Bologna and dissatisfied that he owns a small textile company, manufactures a grand factory, despite being financially weak. Even with Luciana (Bengell), Zambrini had a selfish attitude of ownership that subsequently lead to the separation from his wife and her betrayal with a student. When Luciana agrees to come back to him, Ettore is in the midst of his financial crisis, which forces him to seek any pretext for not sinking completely. At the same time the feisty industrialist manages to discover the identity of the young lover of Luciana. He gets rid of the opponent with extreme violence and with great willpower carries on the business. In the end the protagonist will see his name triumph at the new factory, thus beginning a new life of luxury. Piero Umiliani wrote one of the most beautiful jazz/blues comments of his long and prolific career, performed by Gato Barbieri band and with exceptional soloists (as shown in the Main credits of the film) Barbieri-Rava-D'Andrea-Foccia-Munari. At the time C.A.M. published a 33rpm containing thirteen tracks in mono. The song of the main credits, played by Don Powell, appeared only on the single by Ricordi. In 2009, Cinedelic Records reissued the same material as the 33rpm record on CD for the first time ever in a limited edition of 500 copies. For Digitmovies' CD the label used the mono master tapes of the original session that allowed them to discover new material and to also include the rare vocal version of the single, all restored and digitally remastered. Sonor Music Editions present a reissue of Piero Umiliani's Al Cinema Con Piero Umiliani, originally released in 1969. 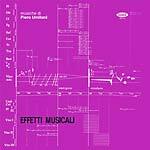 One of the true rarities of Italian discography out there and an absolute grail of Italian film music. Originally released in 1968 on the legendary RCA Italiana SP 8000 series (promo-only) in an edition of 100 copies, here's an impossible jewel by maestro Piero Umiliani that contains various themes from original scores of the '60s: Il Comandante (1963), Extraconiugale (1964), Tutto Il Bello Dell'uomo (1963), La Bella Di Lodi (1963), Controsesso (1964), La Celestina P... R... (1965). Carefully remastered from the original RCA master tapes. 180 gram vinyl; Heavy cardboard sleeve like the originals; Limited edition of 300.